As Alabama's largest park, Oak Mountain provides 9,940 acres of pine-studded ridges and lush green hardwood bottoms. The park offers vacation cottages, golf, pro shop with snack bar, improved camping, picnicking, swimming, boating, fishing, hiking, mountain bike trails, backpacking, a demonstration farm and horseback riding facilities. With the largest area and variety of outdoor recreational pursuits, Oak Mountain is sure to provide excitement for every member of the family! Oak Mountain Golf Course is a public, 18-hole championship course (par 72) designed by Earl Stone. Repeatedly rated by Golf Digest to be among the top 50-75 public courses in the United States, Oak Mountain has hosted qualifying rounds for the Alabama Open. Tee times should be reserved five days in advance beginning at 9 a.m. Please make separate reservations for each foursome. Tee times are not accepted on same day of play (walk-ons are welcomed). Oak Mountain Golf Course features a fully-stocked pro shop and an on-course snack bar, Bermuda greens and tees, and a driving range, chipping green, and practice green open year. Our pro shop is also a WiFi Hot Spot. Senior or Overnight Guest discounts available upon request. Golfers 62 years & older will receive a 15% discount off green fees only. Golfers wishing to receive this discount should notify the clerk prior to payment. Oak Mountain State Park has one meeting room for rent. The meeting room is located at the back of the Park Office. This room has four 8 foot rectangular tables, four 6 foot rectangular tables, & 2 small round tables. 66 chairs are also included with this room. The tables are already set out, however the chairs are not. They are stacked against the wall. We ask that you leave the room as you found it when you arrived. The cost to reserve this room is $80. Payment is due thirty (30) days prior to date of rental. The Park Office Meeting Room needs to be rented through the Reservations Office at 205-620-2524. The price of rental does not include the admission fee per person. The time period for meeting room use is 9a.m. until 4p.m. Oak Mountains' cabin lake is a place of peace and tranquility, hence the name Lake Tranquility. This area is for cabin guests only. The 28-acre lake is nestled in the foothills of Double Oak Mountain and is often used by migrating waterfowl as well as native species of shoreline and wading birds. Our cabins are often used for family reunions utilizing the pavilion by the lake or the meeting room in the area. Ten fully-equipped cabins are open year-round. All cabins are set up for light housekeeping with linens furnished. Each cabin has two bedrooms with 1- King bed and 2-Double beds (MAXIMUM CAPACITY 6), one bath, a kitchenette with utensils and cookware, central heat and air, porch, grill and picnic table. Boats, life preservers and paddles are provided for cabin guests for use in the lake. Additionally, the cabins do not have telephones, but a public telephone is located in the cabin area. Oak Mountain State Park offers two forms of primitive camping. There are several designated back country sites for backpacking that are conspicuously located throughout the park, which offer a view of the varying topography and habitats that are found in the region. These sites with our 50 plus miles of trails offer an assortment of loops that novice and experienced back country campers utilize for a quick get-a-away or preparing for a future hike. Leave-No-Trace ethics is expected of our campers and the usage of open fires is not permitted?.camp stoves for cooking purposes are allowed. Additionally, we offer a group camp facility for Girl Scout, Boy Scout, and Church Groups activities only. 85 Improved Sites (RV) are available with water, electric and sewer hook-ups.60 Walk-In (Tent) sites with water in the vicinity.Modern bathhouses with hot showers located throughout the campgrounds.Dogs are allowed in the Park, but must be on a leash no longer than 6ft; however, they are not allowed in the Cabins at all, any building, or beach area. You must clean up after them & keep them quiet during quiet hours. Reservations recommended and accepted Monday ? Thursday (9:30 a.m. - 4:30 p.m.). The Pro Shop at the Golf Course is a WiFi Hot Spot. Our Country Store keeps in stock those items you forgot as well as a line of camper supplies (sewer hoses, toilet chemicals, electrical adapters, etc.) We also carry snack items as well as gifts and T-shirts. Firewood is available for purchase or you may pick up wood in the park that is ?DOWN AND DEAD?. We are open seven days a week, although our hours of operation vary seasonally. Reservations accepted Monday ? Thursday.A non-refundable deposit is required to hold a reservation.Registration guarantees you a site when you arrive, ?not a particular site?.Weekends require a two-night minimum reservation.Holidays require three-night minimum reservation.Registrations are accepted up until 9 p.m.Park Quiet Hours are enforced between 10 p.m. and 6 a.m.Complete State Park Rules and Regulations are posted in conspicuous locations throughout the park. Oak Mountain State Park has a friendly and courteous staff, which strives to make you feel at home during your stay. Also as a family oriented campground, our Law Enforcement Rangers and security personnel make regular patrols to ensure the safety of our guests. The park closes one hour before sunset and the entrance gate is manned 24 hours a day to provide for the guests? security. Only registered guests are allowed into the park during these hours, for emergencies call 205-620-2520. Swimming area located behind the Park Office on Terrace Drive. Swimming area also located in Campground. Swimming is not allowed at the two fishing lakes at the back gate. There are several lakes for fishing at Oak Mountain State Park. Fishing licenses are sold at the Park Office and the Fishing Center. Bait is for sale at the Campground Country Store, at the Back Gate and the Fishing Center store. Flat bottomed fishing boats that hold 4 people are also for rent at the Back Gate. Paddles and life preservers are furnished. You can bring your own electric trolling motor to use on our boats if you wish. If you want to bring your own boat to our lakes, gasoline motors are prohibited. Seasonally, Oak Mountain State Park operates a marina with canoes and pedal boats for rent. The season begins with a week at Spring Break in March and opens full time when school is out in May. The Marina is located on Terrace Drive. Oak Mountain Fishing Center is located at the north end of Oak Mountain State Park, just inside the park's back gate, a half-mile from State Highway 119, five miles east of Interstate 65 and three miles west of US 280. Please use the back gate for the Fishing Center only. All other visitors should use the main entrance at Interstate 65. The back gate is closed after dark. Oak Mountain offers two 85-acre lakes stocked with largemouth bass, bream, catfish and crappie. Both lakes are fertilized and maintained, and open year-round. No gasoline motors are allowed, but electric trolling motors are welcome, and john-boats are available for rent. Private boats may be launched from either lake. Bait is for sale at the Campground Country Store, at the Back Gate and the Fishing Center store. State Law requires fishing licenses for both Alabama residents and non residents. Licenses are available at the Fishing Center Store and Park Headquarters. 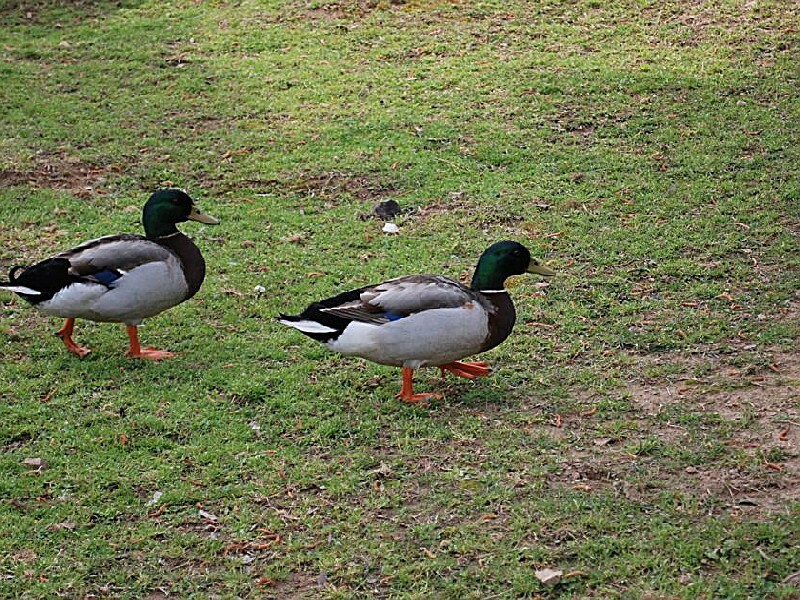 Restrooms and picnic tables are located within the two lake area. Tackle, supplies and bait are available at the Fishing Center Shop or at the back gate. The day-use activities at Oak Mountain State Park set it apart. With the oldest continuously operating BMX Track in the nation, over 50 miles of hiking, biking and equestrian trails set in a picturesque 9,940-acre park, there is something for all outdoor enthusiasts to appreciate and enjoy. The park's day-use picnic facilities include large picnic pavilions and picnic tables with grills, two fishing lakes on the north end of the park (Fishing Center) and in the Main Day-Use one recreational lake with pedal boat and canoe rentals, a sandy beach swimming area, a large open playing field, ample shoreline for bank fisherman and a boat launch for your personal boat (no gas operated motors, but electric trolling motors invited). Caterers are allowed in the park, to include "Moon Walks" & similar items. 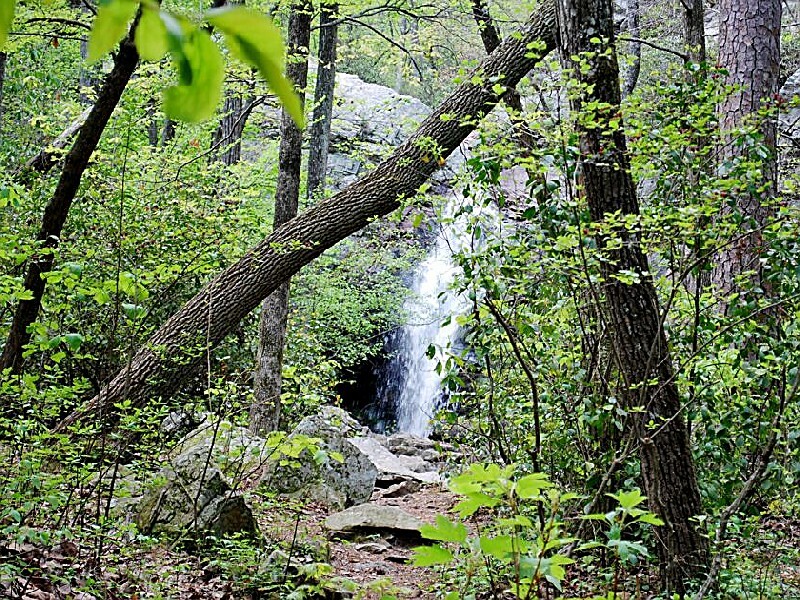 Oak Mountain State Park has approximately 51 miles of trail that people enjoy on a daily basis. We have the Red, White, Blue, Yellow, Green, and Orange trails. The Red, White, Blue, and Yellow Trails all begin at the North Trailhead, which is located on John Findley Drive about 6 miles inside the park if you are coming from the front gate. If you use the back entrance, it is about 1.5 - 2 miles inside the gate. The Green Trail begins near the Park Office on Terrace Drive. The Red Trail meets Terrace Drive in several places. The Yellow Trail also ends on Terrace Drive near the South Trailhead. The beginning of the Orange Trail is located on John Findley Drive near the stables. The Red Trail, also known as the Double Oak Trail, is designated as the bike trail and is 17 miles long. It is steep and rough in places. Hikers, as well as bikers, can use this trail; however, this is the only trail in the park that bikers can use. The Red Trail is a loop. The White Trail, or the Shackleford Point Trail, is 6.4 miles long (one way). You must turn arouns and come back the way you came or pick up a connector trail to go a different way. It begins at the North Trailhead and follows a path similiar to the Blue Trail but at a lower elevation. The White Trail does climb to the highest point in the park, which is known as Shackleford Point at an elevation of 1,260 feet. The White Trail ends at the Peavine Falls parking lot. The Blue Trail, or the South Rim Trail, is 6.7 miles long (one way). You must turn around and come back the way you came or pick up a connector trail to go a different way. Beginning at the North Trailhead, the Blue Trail makes a steep climb up the ridge, going from an elevation of approximately 620 feet to approximately 1100 feet. 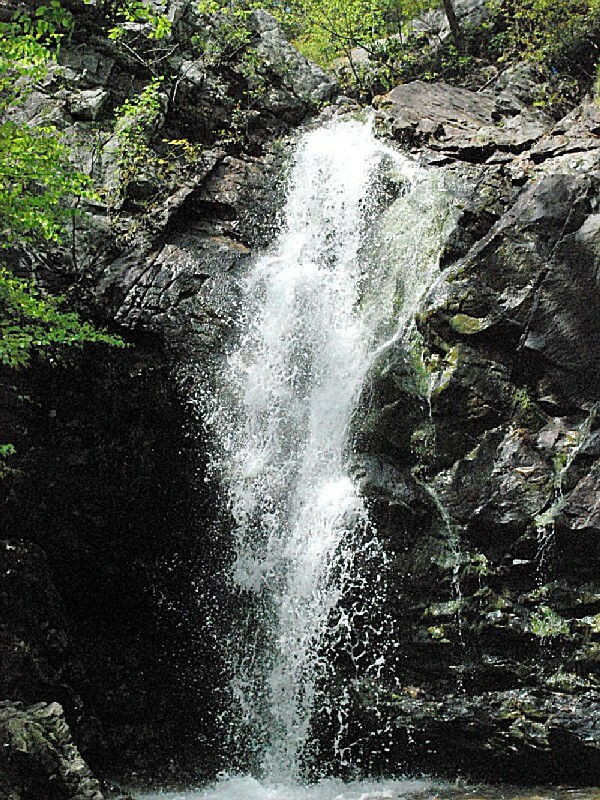 Once the ascent is made, the trail follows the ridge to end at the Peavine Falls parking lot. The Yellow Trail, known as the Foothills Trail, is approximately 8 miles long (one way). It begins at the North Trailhead and travels at a low elevation around Lake Tranquility to end at Peavine Road close to the South Trailhead area (off Terrace Drive). The Yellow Trail does make some climbs. Maggie's Glen is a popular spot to hike to. It sits along a stream bank with many species of plants and trees growing there. It is a very quiet place to sit and relax. It can be accessed from the White Trail, the Yellow Trail, and the Red/Yellow connector. The Green Trail, known as the Peavine Falls Trail, begins near the Park Office/Beach area on Terrace Drive. It is the shortest trail at 1.9 miles long, but it is also the steepest. The Green Trail goes from an elevation of approximately 550 feet to approximately 1,100 feet. The Green Trail doesn't lead directly to Peavine Falls (the waterfall) but ends at the Peavine Falls parking lot where you can get on the White or Blue Trail that will take you to the falls. About 1 mile up the trail from Terrace Drive, you begin a climb from approximately 800 feet to approximately 1,020 feet. The Wildlife Center Trail is a short 0.3 mile trail. It leads from the beach parking lot up to the Wildlife Center. It also connects to the Treetop Nature Trail (which is an elevated boardwalk with several cages housing birds of prey that have been rehabilitated after having been injured), the Yellow Trail, and the Orange Trail. The Orange Trail is known as the Horse Trail and is 10.7 miles long. The trail begins at the stables (located on John Findley Drive) and winds around through the woods to end back at the stables. The Orange Trail is for horses only, no foot or bike traffic. Oak Mountain State Park is the largest State Park in Alabama, with nearly 10,000 acres. Golfing ? Recently renovated 18 hole course. There is also a Golf Pro Shop with a complete line of equipment and accessories for sale.Golf Snack Bar ? Offers a very nice menu and eating area for park guests and golfers.Driving RangeHorseback Riding: Guided trail rides are available Wednesday thru Sunday. If you bring your own horse and stay overnight, boarding for your horse is available. We recommend calling the concessionaire at 205-620-3575 for reservation information. They are currently closed on Mondays and Tuesdays. Call for Rates. The minimum age for riding is 8 years old with or without an adult. If you want to ride on Wednesdays, Thursdays, or Fridays, please make a reservation first. On weekends they take walk-ins, but a reservation is recommended if you want to be guaranteed a ride. These are guided trail rides and reservation times are from 10 a.m. until 4 p.m. Wednesday through Sunday.Cabin Rentals ? 10 Secluded CabinsHiking: Because of the length of the Park (Approximately 7 miles), there are miles of hiking and biking trails available for your use. Park Maps with each trail listed are available for sale at the Park Office and several other facilities.Biking ? Road and Mountain BikingBMX Track (Bicycle Moto Cross): There is a BMX bike track here on the park that is sponsored by a local BMX Group. This facility can be used by the public except on the weekends when the BMX group holds races/events. Go to oakmountainbmx.com to learn more about race dates and the track or call the track director at 205-680-5827. 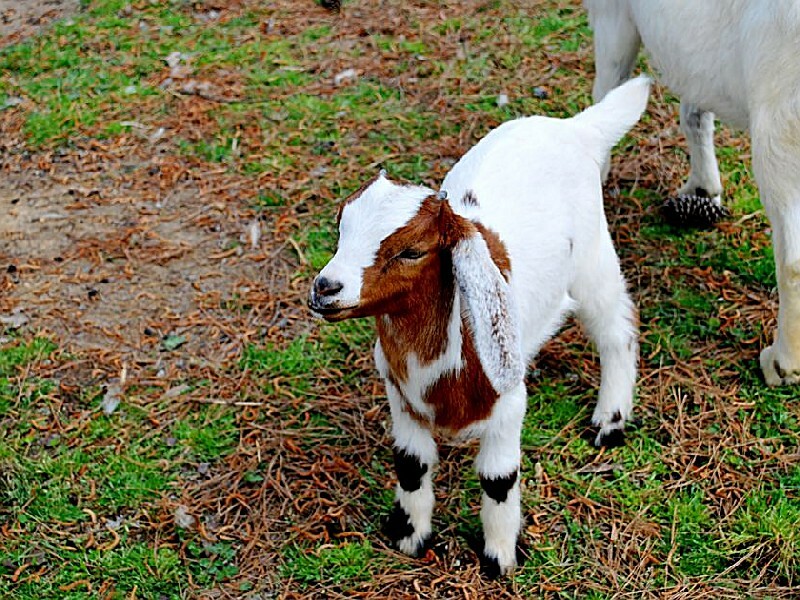 Picnicking areas with picnic tables and grills furnished throughout the parkPetting/Exhibit Farm: We have a petting/exhibit farm that can be visited from 7 a.m. until 3 p.m. Monday thru Friday. 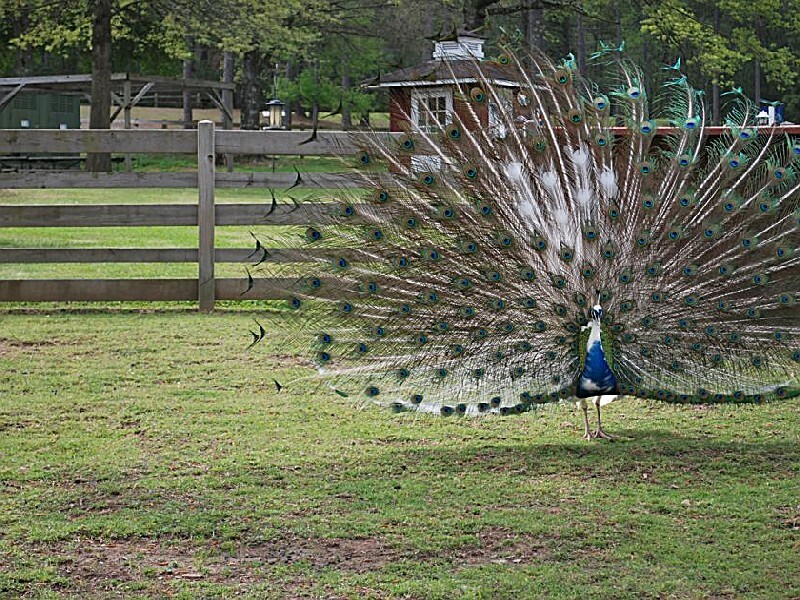 Weekend hours are 8 a.m. until 4 p.m. We have a varied assortment of animals and birds to see and interact with. With also rent out the Top of the Barn for birthday parties and events. The Top of the Barn needs to be scheduled in advance through our Reservations Office at 205-620-2524.We offer private hayrides as well. Reserve these by calling the farm at 205-620-2526. We now have scheduled weekend hay rides at 10:00a.m., 12p.m., and 2:00p.m. Fishing Lakes and Fishing Boat Rentals Aluminum john boats are available for you to rent. They are located at the Fishing Center at the back of the park. Lifejackets and paddles are provided for your use or you can bring an electric trolling motor to use on the boat. NO gas motors are allowed.Swimming: The swimming area is located behind the Park Office on Terrace Drive. There is no charge for swimming after you enter the park. We have a nice sandy beach area for swimming and picnicking. Restrooms and changing areas are available on the beach. NO ALCOHOL IS ALLOWED ON THE BEACH AND NO LIFEGUARD IS ON DUTY. Alabama Wildlife Center: Located in Oak Mountain State Park, across from the marina, or park at the bottom of the Treetop Nature Trail and walk to visit the hospital site. The AWC receives about 2,500 orphaned or injured animals from 100 different species annually. They are located on the web at www.awrc.org. Our hotline is staffed 13 hours each day, 365 days each year: 205-621-3333. Recovering animals are on display so that guests may witness the incredible work the Alabama Wildlife Center performs, and may make a donation for their care.Oak Mountain Interpretive Center: The Oak Mountain Interpretive Center is a joint venture between Oak Mountain State Park and Samford University. The Interpretive Center has 2,500 square feet of interactive exhibit space, a meeting room, and teaching laboratory. The Interpretive Center is will be open from 9:30a.m. until 4p.m. Wednesday through Saturday, and from 1p.m. to 5p.m. on Sundays. The park is absolutely beautiful and an amazing place to hike with so many levels. We tent camped and the only downfall was the poison ivy was everywhere in the camping area. Nice Park, Poison Ivy was out of control. They need to spray especially in the camp ground common areas. Children could not explore Nature. Very disappointing compared to our previos stays. I hiked the Blue and Green trails. Well marked trails that lead to an awesome waterfall. Not too crowded either.